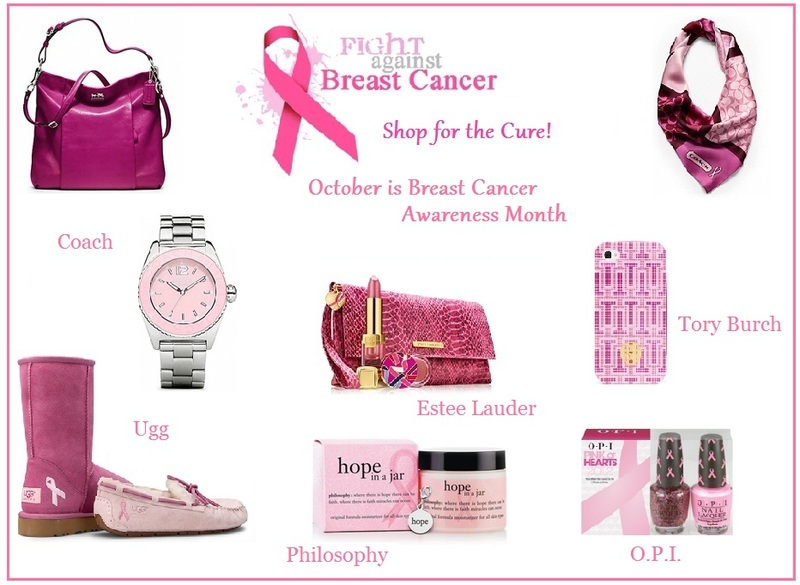 It’s October~ Think pink and shop for the cure! We all know someone who has been affected by breast cancer, making it more important than ever to find a cure. October is National Breast Cancer Awareness Month, and many of our favorite designers have gone pink by creating limited edition products to support the cause. Coach has created bags and accessories for their “Coach for a Cause” collection. 20% of these purchases in October will go towards the Breast Cancer Research Foundation. From pale pinks to bright magentas in their palette, there’s something for every woman. And for those of you who love comfort, Ugg has already donated $25,000 to the Susan G. Komen Foundation this year with the sale of their limited edition pink boots and slippers. With cold weather coming, who wouldn’t want warm shearling on their feet? While some promotions end on October 31st, Estee Lauder will continue to donate proceeds of their “Dream” collection of makeup and skincare through June 2013. I love that they aren’t limiting their charity to just one month, since it is such an important cause to remember all year. Other beauty products that are support breast cancer awareness this October are Philosophy’s “Hope in a Jar” (which is an amazing daily moisturizer for girls of any age and skin type) and O.P.I. nail polish. Their lighter pink color, “I Think in Pink,” is one of my favorite shades… I definitely would recommend it! My favorite designer participating this month is Tory Burch. Her team has created a printed pink iPhone case and a white jewel-trimmed tee which help support the Breast Cancer Research Foundation. Her website also features several great items for her own philanthropy, the Tory Burch Foundation, which helps women entrepreneurs. Although October is flying by, it’s not too late to support the cause in style! Check out pictures of our favorite pink products below to see how we shop for the cure. Are there any designers you love who are also supporting Breast Cancer Awareness Month? No matter how you wear your pink, be sure to spread the word to all the women in your life about how they can protect themselves against breast cancer. Early detection is key in beating the disease, so mammograms and monthly self breast exams are important. You can also get information about the fight against breast cancer at websites like http://www.nationalbreastcancer.org/ or http://ww5.komen.org/.